This is the cleanest approach to a Brainwave Deck ever. You take a red deck out of a red card case (also available in blue back version). You can show all faces as you really have a complete deck. Let your spectators name any card they want, or - even better - ask three different spectators for three different cards. No force, no stooges, no sleights! You spread the deck to find the three named cards. Take out the three cards and place them in front of the deck. Turn over the deck and spread it openly to show a complete red deck. Then - one by one - turn over the chosen cards to show that they are all blue! This is by far the cleanest, fairest and easiest Brainwave effect. Other presentations are possible, perhaps you can also reveal a single card only. You could even spot the selected cards from the back as the backs are marked. Your creativity will be your limitation. I admit, it wasn't that I doubted that there could be a Brainwave deck that fully justified its price point at over four times the price of the standard one in the Phoenix series...but I was quite curious as to what made this deck so special, and what justified the price point. A few questions to the fine folks at Vanishing, and I took the plunge. Wow. Okay, yes, I get it now. This really is a gamechanger Brainwave deck. First, taking care not to divulge any secrets...let me simply say that the tactile quality of these cards is amazing. I had expected to need considerable practice in handling them before I was ready to perform with them; one hour of casual handling left me confident enough to try them out on one of my more skeptical regular audiences, with spectacular results. These cards handle beautifully, and shoulder the brunt of the unique handling concerns for the magician handling them. As a magician with difficulty with my hands, a great many "moves" are beyond my ability, and I had my doubts that I could manage the degree of tactile control needed to use this deck. Again, I cannot state clearly enough how much of the work the deck does for you, and how comfortable and easy it is to use. As the copy notes, you're working from a complete deck, which can be shown from both front and back. Any card named can be selected, and location of your desired card is particularly easy with this deck -- this is something I hope to see on every Brainwave deck, someday! This is everything I wanted from a Brainwave deck, prebuilt, ready to go out of the box. It even includes some things I didn't realize I wanted from a Brainwave deck; some of the unexpected bonus features broaden the Brainwave deck platform and encourage development of new routines, not possible with a standard Brainwave deck. In my own routines, I prize versatility of a deck. I'd shied away from Brainwave and decks like it, out of concern that investing in "singletasker" products represented an outlay of cash and space in my travel bag for a product with limited scope of return on investment. I respect big impact, but it's not my style, as a magician -- I aim to be the guy who can do a hundred fairly interesting things with a very small toolkit. 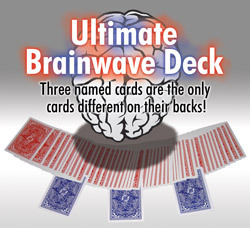 This Ultimate Brainwave deck didn't just show me how impressive the famous Brainwave reveal could be, nor did it simply place Brainwave into my shaky, nerve-damaged hands as something I could actually execute reliably. Either of those would have been reason enough to praise this deck as completely worth its asking price. Instead, on top of this, the Ultimate Brainwave deck added so much value to the Brainwave family of effects that it's inspired me to return to the drawing board and write new routines, showcasing what this deck can do. This is how I felt when I first started playing with the Stebbins stack, or when I first discovered mathematical forces. I really, genuinely never thought I'd be championing a Brainwave deck, yet here I am, raving about it. If Brainwave interests you in the slightest, do it right. This is the deck to use, and yes, it's absolutely worth the price.